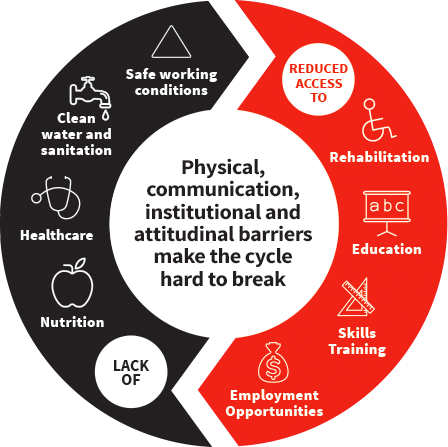 Children living with disability in developing countries are far more likely to be isolated, cut off from friends, community, education and a promising future. Whether a mom, a dad or a child is living with a disability, their whole family is much more likely to live in extreme poverty. Why? Because poverty is both a consequence and a cause of disability. At Hope and Healing International, we have over 110 years of experience developing proven community-based programs that help millions of people break out of the poverty-disability cycle, allowing them to benefit from real, lasting change. 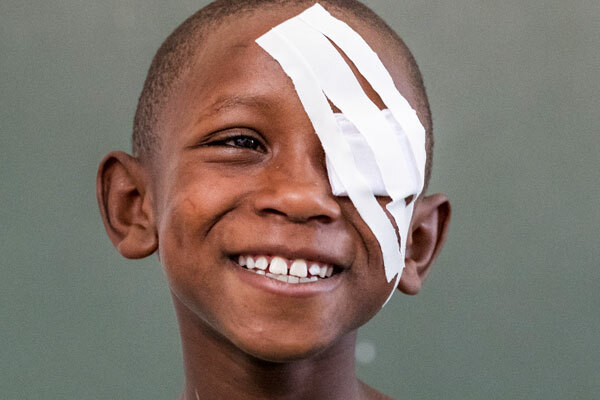 Hope and Healing International works with local partners to treat preventable and curable causes of blindness such as cataract, river blindness and trachoma. We work to identify and treat conditions like club foot and cleft lip, as early in a child’s life as possible, to avoid or minimize permanent impairment. Hope and Healing International works together with local partners and with our clients to develop custom rehabilitation plans that address physio and occupational therapy needs, assistive devices and other rehabilitation services. The goal is to make each child, each mom, each dad living with a permanent impairment or health condition as able and independent as he or she can be. Our work opens the door for people with disability to gain access to an education, open a business, earn a living, make friends and be part of their community, often for the first time in their lives. To give 877,900 people preventive and curative medical care in 2018 (a 3% increase), 903,700 per year by 2021 (a 5% increase). To give preventive treatment to an additional 200,000 people at risk of disabling neglected tropical diseases in 2018, 300,000 additional beneficiaries by 2021. To distribute 61,900 assistive devices in 2018 (a 5% increase), 67,800 per year by 2021 (a 10% increase). To give 116,800 children and parents therapy and rehabilitation services in 2018 (increase 5%), 127,900 by 2021 (an increase of 15%). To give 5,100 children with disability access to education services in 2018 (a 5% increase), 5,600 per year by 2021 (a 20% increase). 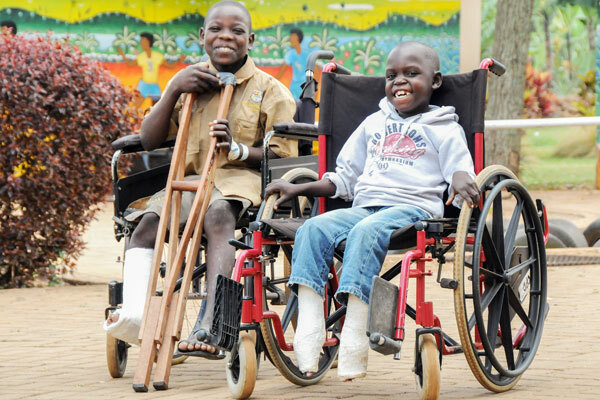 To give 5,292 people with disability or caregivers of children with disability access to livelihood services (vocational training, loans, financial literacy training) in 2018 (increase 5%), 5,800 by 2021 (an increase of 15%). Good international development changes lives and communities for the better. The change is demonstrable and it’s for the long term. We believe transformational development has six key characteristics. What does it mean that Hope and Healing International is a Christian international development organization? It absolutely does NOT mean that we provide our services only to those who accept our faith. It does mean that we strive to value every last person as Jesus values them, as a beautiful, created being. It also gives us the courage to go to some of the world’s toughest places. If we’re going to reach the poorest of the poor, we need to reach out into the communities where the poorest people live. We need grassroots advocates who are trusted within those communities. We need to engage our clients and their families and communities in our program plans and implementation. The official name for this way of working is Community Based Inclusive Development and we are world leaders in this field. Not only do our services need to reach into communities, but the services need to be “owned” locally. For this reason, Hope and Healing International chooses to work through local hospitals, schools, community programs, rather than setting up our own shop. This collaboration makes our work better – in terms of local expertise, cultural appropriateness and sustainability. While providing medical and rehabilitative solutions at the individual level and advocating at the grassroots community level, we also work within the framework of the UN Convention on the Rights of Persons with Disabilities (CRPD), the UN Convention on the Rights of the Child (CRC) as well as the Sustainable Development Goals (SDGs). There are many cautionary tales of top-down development schemes gone wrong. Without consulting the very people a program aims to serve, water wells go unused, clinics go unattended, microfinance loans disappear without return for the family… more than 100 years of experience and expertise has taught us the wisdom of “nothing about us, without us”. We do our best to avoid reinventing wheels. We’d rather partner with other global development experts in distributing emergency food aid or in microfinance loans… So it made sense that we would partner with Habitat for Humanity to pilot a joint build of accessible homes for families in Ethiopia and Malawi living with the added challenge of disability. We’re just getting started! When we ask the moms and dads we serve what they want most, they answer “Jobs” – to feed their families, to keep their kids in school, to break free of poverty. 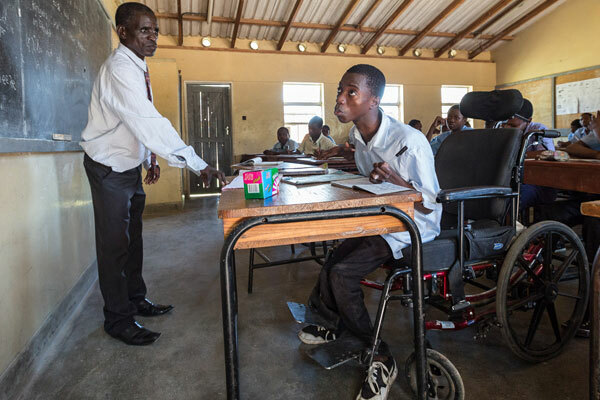 In Malawi we are working with existing microfinance institutions, asking them to provide loans for people with disabilities – to make their services inclusive. We are willing to back the loan because we’re proving that our clients are successful in repaying their loans. We’re out to change microfinance in the countries in which we work – overcoming assumptions and stigma and opening it up to entrepreneurs, regardless of their different mix of abilities. Hope and Healing International is one of the oldest and largest global development organizations focused on ending poverty for people with disability.